Now you can enjoy the thrill of listening to live radio signals from all over the world with the Alinco DX-R8T/E. A new desktop shortwave radio designed to be affordable without compromising performance, the DX-R8T/E boasts a communications grade receiver circuit, 3 ceramic filters (FM/AM, SSB, CW) with narrow filter function, excellent 1ppm stability and a large, easy-to-read LCD screen. The I/Q output mode with supporting SDR freeware lets you to output the I/Q signal from the 3.5mm stereo jack and decode DRM using only a PC and a sound card. Simple operating commands and straight-forward key layout make this a radio that you can start enjoying from the moment you first turn it on. 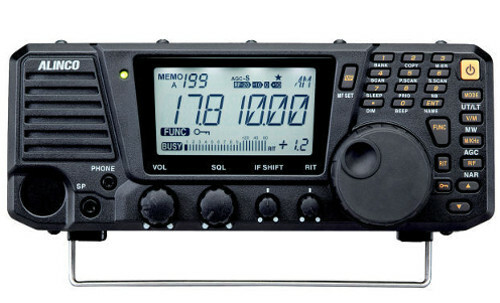 Packed with many features normally found only in more expensive shortwave receivers, the DX-R8T/E is ready to capture the imagination of everyone from a beginner in the world of shortwave to the most experienced shortwave listener. Frequency stability : ± 1 p.p.m.